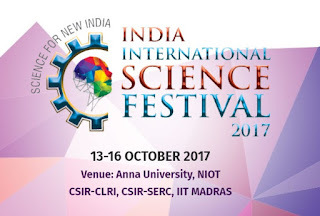 India International Science Fest on 13-16 October 2017 in Chennai, Tamilnadu. A four-day 'India International Science Festival,' organised by the Union Ministry of Science and Technology, will begin here on October 13, Union Science Minister Harsh Vardhan said in Chennai. The fest, to be held in multiple venues, including Anna University, Central Leather Research Institute (CSIR-CLR) here will feature a series of events, he said. Stating that the response to the fest was overwhelming, he said after the science festival, there "should be good quality scientific temper and passion." On the progress made by premier research institution CSIR (Council for Scientific and Industrial Research), he said the institution which last year was at the 12th position among about 1,200 government funded research institutions worldwide, had moved up to ninth rank as per the Scimago Institutions ranking World Report 2017. Similarly in global ranking for private and public funded institutions, CSIR which held the 99th position, had improved to 75th rank among about 5200 institutions across the world. Besides Anna varsity and CSIR-CLRI, events will be held at Structural Engineering Research Centre (CSIR-SERC), National Institute of Ocean Technology and IIT-Madras, he added. 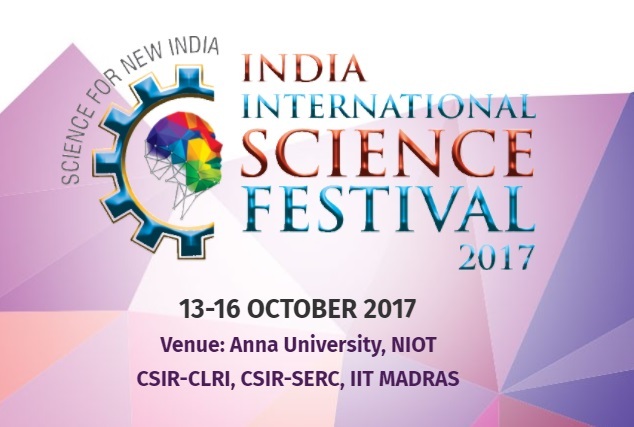 A meeting of Science and Technology Ministers will be held on the inaugural day of the festival at IIT Madras here.